Coming off of a 4-8 season, the Notre Dame coaching staff did a great job assembling the core of their 2018 recruiting class. Come August, Notre Dame had 16 commits heading into the season which placed them in the top 10 nationally in recruiting. With that core already assembled, the staff slowed their pace of adding commitments as they turned their focus up the board in an attempt to add elite talent which would make the difference in a team attempting to win their first national title in nearly 30 years. The first two months of the college football season were slow in recruiting. Notre Dame continued to host elite talent, but were slow to add to their class. In September, the theme was singular: elite prospects were watching to see what changes were taking place in South Bend. With everything that was going on the field, the response off the field was positive. Recruits loved the changes that were made in this Notre Dame team. Recruits loved the Notre Dame physical style of play. Defensive players responded positively with defensive coordinator Mike Elko’s new scheme. The defense looked more assignment sound, aggressive in getting after the quarterback, and more opportunistic. Altogether, September served as a bounce-back month on the football field as the program returned to respectability. There was no more losing to inferior teams such as Duke. Notre Dame didn’t get blown out by elite programs as they led Georgia for most of the game and were several plays away from winning themselves. What’s more, they were blowing out teams that they were supposed to and even ones they weren’t instead of playing down to their competition. But while Notre Dame got out to a 4-1 start in September, there was still a certain level of skepticism of how good this team really was. What Notre Dame began in September, was improved upon in October. Without having starting quarterback Brandon Wimbush in the lineup for a rainy road trip to UNC, the defense and offensive line were forced to step up. The defense had their best all around performance up to that point constantly pressuring quarterback Chazz Surratt on every play, forcing three UNC turnovers, showing good tackling, and holding the offense to 265 total yards. The offensive line also had a great day as they gave Ian Book all day to throw in his first start as he ran a more expansive passing game. The line also excelled in the run game as their top three running backs were all limited with ankle injuries yet managed to produce two 100-yard rushers with Josh Adams leaving early while fourth-string Deon McIntosh had a breakout game for 124 yards on 12 carries for 2 touchdowns. This gave Notre Dame all the momentum heading into the bye week at 5-1 with the opportunity to get healthy as well. 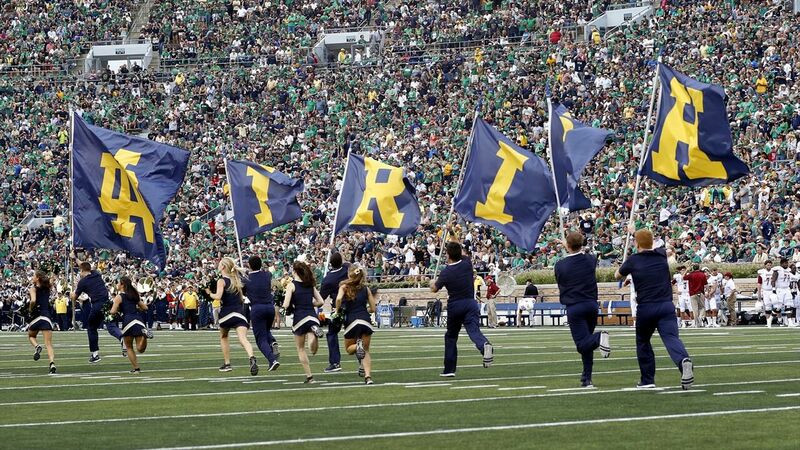 Coming out of the bye week, Notre Dame hosted 82 recruits for a prime-time matchup against #11 USC at home. The Irish hosted numerous top 100 prospects including 5-star receiver Amon-Ra St. Brown, 5-star offensive tackle Nicholas Petiti-Frere, linebacker Solomon Tuliaupupu (#59 overall), and many more. While Notre Dame still had their skeptics going into the matchup who doubted how improved this team was, they left all doubts behind and opened many eyes with a 49-14 beatdown of rival USC. There were few who expected Notre Dame to win so convincingly that it began to change the momentum in Notre Dame’s recruiting. The win against USC provided Notre Dame with the big-time signature win that they needed to grab national headlines and get them back on track with the elite recruits that they were targeting on their board. Teammates Amon-Ra St. Brown and Solomon Tuliaupupu left South Bend buzzing. For St. Brown, it appeared as though Notre Dame was solidly back in first place for him. For Tuliaupupu, Notre Dame jumped into his top three schools whereas before they were more of an afterthought. Indiana safety Paul Moala who had already visited a handful of times also felt compelled to commit following the game giving the Irish their first commitment in over two months. Georgia tight end Tommy Tremble was another who came away from that game on the verge of committing. The staff also made headway with three-star defensive backs in safety Avonta Crim and cornerback Tariq Bracy (#457 overall). What’s more, the win opened the eyes of recruits nationally who began to reconsider Notre Dame as their final destination. Coming into the weekend against NC State, the staff managed to set up some visits with players at need positions. Notre Dame’s hot start to the season and continued success brought two committed players in cornerbacks Alontae Taylor and Noah Boykin to South Bend. Taylor who is a four-star prospect and #149 overall is currently committed to Tennessee, but it appears as though his commitment is wavering considering the Vols horrible season. With head coach Butch Jones on the hot seat and unlikely to return, the Irish impressed Taylor on his visit and likely became the frontrunner for his signature come signing day. Maryland commit Boykin is a high three-star prospect who is #451 overall but has a long frame at 6′ 2″ and the athleticism to make him dangerous. The staff are very high on Boykin and had him hosted by Kofi Wardlow who was also from the DMV area and was flipped from the Terrapins himself before signing day. With Notre Dame having all of the success that they’ve had on the field, it has translated into much needed momentum in recruiting. With 17 commits already in the class, they have a plethora of elite talent considering the Irish. With back-to-back wins against teams in the top 15, the staff have managed to set up critical visits for elite players down the stretch in November. They recently were able to lock in a visit from five-star offensive tackle Cade Mays who is also reconsidering his commitment to Tennessee for December 8th. Notre Dame’s success also got four-star linebacker Payton Wilson (#68 overall) to reconsider his pledge to UNC and visit South Bend on November 18 against Navy. Louisiana four-star slot-receiver Lawrence Keys III (#225 overall) will also be on campus for Navy that weekend. With Notre Dame continuing to have success on the field and potentially locking up a place in the college football playoff, the momentum should only continue to build in recruiting as they look to also lock in a top-5 recruiting class. The on-field success the Irish are experiencing should only continue to yield more momentum in recruiting off of it.